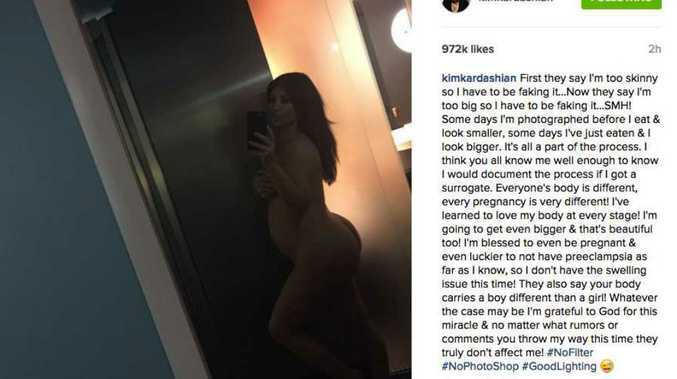 KIM Kardashian West has posed naked to rubbish claims she's been faking her pregnancy. The 34-year-old star - who revealed she was pregnant with her and her husband Kanye West's second child earlier this year - has taken to her Instagram account to slam critics of her changing figure. She wrote: "First they say I'm too skinny so I have to be faking it...now they say I'm too big so I have to be faking it...SMH! Some days I'm photographed before I eat & look smaller, some days I've just eaten & I look bigger. It's all a part of the process." The 'Keeping Up With the Kardashians' beauty - who was open about her and Kanye's struggle to conceive again following the birth of their daughter North in 2013 - showed off her baby bump in a naked selfie to prove those who claimed she's faking her pregnancy wrong. The curvy brunette continued: "I think you all know me well enough to know I would document the process if I got a surrogate. Everyone's body is different, every pregnancy is very different! I've learned to love my body at every stage! I'm going to get even bigger & that's beautiful too!" Kim - who is expecting her first son with the 'All Day' rapper - also admitted she's relieved she's not suffering from the same condition she experienced during North's pregnancy. She added: "I'm blessed to even be pregnant & even luckier to not have preeclampsia as far as I know, so I don't have the swelling issue this time! They also say your body carries a boy different than a girl! Whatever the case may be I'm grateful to God for this miracle & no matter what rumors or comments you may throw my way this time they truly don't affect me! #NoFilter #NoPhotoShop #GoodLighting (sic)." Kim Kardashian West going back to school? Rob Kardashian considering gastric bypass surgery?